Though less aggressive than expected, the craze surrounding USB 3.0 seems to be showing no signs of fading. And the high speeds promised by switching to it are the main fuel that is feeding the flame. To honor the pull of curiosity and the subsequent demand from consumers, Corsair has released the Corsair Flash Voyager Slider. Long recognized in the computer industry as a company that produces high performance and high quality USB flash drives, Corsair does not disappoint with its latest release. 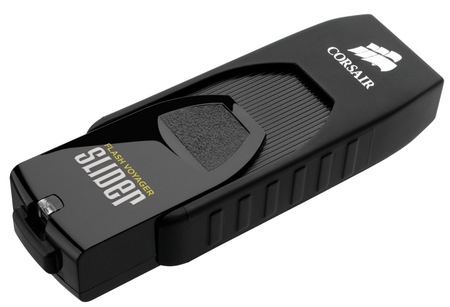 The Corsair Flash Voyager Slider series comes in four memory storage capacities: 8 GB, 16 GB, 32 GB, and 64 GB. The drives’ speed performance depends largely on their storage capacity. In the Flash Voyager’s case, the higher the storage capacity of a drive is, the faster its reading and writing speeds. Continuing this logic, the line’s 8 GB and 16 GB models offer the lowest speeds, the reading speed clocks up to 70 MB/s, writing speed up to 20 MB/s. The 32 GB model offers a mid-range writing speed of 40 MB/s but maintains the reading speed of the lower capacity models. It is no surprise then that the 64 GB units have the highest performance scores. Reading speed is hiked up to an additional 5 MB/s at 85MB/s, and writing speed reaches a blazing 70 MB/s. The Flash Voyager’s other features further buoy its initial appeal. On the software front, it displays its flexibility by offering plug and play support for Windows, Mac OS, and Linux. Corsair also designed the USB line to be backward compatible with USB 2.0 ports, a potentially bright marketing move aimed to fully sway those still hesitant to make the switch to USB 3.0. Its physical design is a move toward simplicity and efficiency. The units were designed to have retractable USB plugs, so users no longer have to worry about losing the protection cap that comes standard with USB drives. As a final statement of quality, the USB line is covered under Corsair’s five-year warranty. The Corsair Flash Voyager Slider USB 3.0 is now available worldwide through authorized dealers and can also be found in online retail stores. The list price for each model is as follows: $12.99 for 8 GB, $17.99 for 16 GB, $29.99 for 32 GB, and $64.99 for 64 GB. Care about the Flash Voyager Slider? Make sure you get heard by commenting below! This entry was posted in Articles, Corsair, Corsair USB 3.0 Drives, SuperSpeed USB 3.0, USB 3.0, USB 3.0 Flash Drives and tagged Corsair, Corsair Flash Voyager Slider, Corsair Flash Voyager Slider USB 3.0, Flash Voyagor, high quality USB flash drives, USB 3.0. Bookmark the permalink.